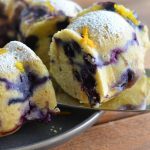 Instant Pot Orange Blueberry Muffin Bread is the perfect addition to any morning! Not to sweet, and packed with tons of flavor, this bread will help you and your family get the morning started the right way! Grease and flour a 6-cup bundt pan. Mix the flour, baking powder, and salt in a small bowl. Reserve 2 tbsp of flour tablespoons for later. Add zest, sugar, and butter to a mixer and beat until thoroughly combined, scraping down the sides when needed. Then add egg and vanilla to mixer and combine. Add 1 cup of the flour mixture, milk, and lemon juice to the sugar mixture. Mix completely before adding another cup. Continue on until everything is mixed well. In a separate bowl, lightly toss the blueberries with reserved flour. Then, gently fold the blueberries into the batter. Pour 1/2 cup of water in Instant Pot and place in the trivet. Pour batter into your greased and floured bundt pan then cover with paper towel and tin foil. Turn Instant Pot on to manual high pressure (the pressure cook button for newer models) for 50 minutes. Once cooking time is up, allow for a 20 minute natural release. Uncover cake and allow condensation to evaporate before transferring to a serving dish. Allow cake to cool completely. Mix the orange juice powdered sugar in a small bowl then pour over cake.